Could you go a whole year without speaking? That’s what James Aspey from Sydney, Australia, is doing. 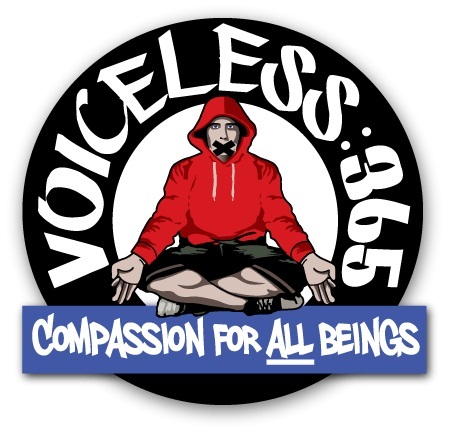 To help raise awareness about animal exploitation (and a bit of funds for the nonprofit Animals Australia), James launched Voiceless365 and kicked off 2014 by beginning a sojourn around Australia in a van and silently promoting compassion toward all beings. James took some time to discuss his campaign via email. What gave you the idea that a vow of silence would be an effective way to get active for animals? To be perfectly honest, initially I didn’t have the idea to take a vow of silence as a way to get active for animals. I was five days into a 10-day silent meditation, and the idea of a taking a one-year vow of silence just came to me. I realized the only way I could be motivated enough to take on such a challenge and see it through to the end would be to do it for something I cared deeply about. I was tossing up between a few ideas but as a new (two-month-old) vegetarian who had recently been shocked, appalled, disgusted and awakened from my ignorance in regards to the horrific treatment of animals for trivial reasons such as palette pleasure, I decided the only thing I cared enough about was my newfound passion for reducing the suffering of animals. I felt like I owed it to all the animals who had suffered because of my choices, to dedicate my life to helping them. That’s when I realized it actually made sense. Animals are the same as us in many ways. They enjoy pleasure and avoid pain. They seek food and shelter. They have families and companions. Only two main differences are obvious to me: 1. They are shaped differently than humans and 2. They cannot communicate with words. In our definition of the term, they are voiceless. Apart from that obvious comparison, I haven’t ever known or heard of anyone to volunteer to stop talking for a year. The idea of it intrigued me very much and I figured if it intrigued me, it would intrigue others. So using that logic, I assumed I could spread a message of compassion for animals to a far greater audience through the Voiceless365 campaign and social media sites than I would be able to using my voice alone. Your campaign is benefitting Animals Australia. What particularly appeals to you about this organization? Initially, it was hard for me to choose where I wanted the raised money to go as the whole animal rights thing was still new to me. I regularly visited websites and pages of organizations working to create a better world for animals and decided on Animals Australia because I found their message to be clear, direct, palatable to a wide variety of people (from meat-eaters to vegans), up to date with the latest news, and when I found out they also donate some of their money to other organizations with similar interests, my decision was made. So many activists use their voice to communicate. What non-verbal tools do you use to raise awareness about animal suffering? Yes, and my deepest thank-you goes to anyone who is brave enough to speak up and spread the message. My greatest asset is my website, Voiceless365, which has a link to my Facebook page and daily blog detailing my experience travelling around Australia during the vow of silence. I conclude each entry with thought-provoking quotes, photos or messages regarding the way animals are treated by humans and why we should give them respect, compassion and protection. My idea is to plant a seed each day and hope after 365 days, at least some of them have begun to grow. The website also has links to the things that helped me to awaken and transition to veganism. Famous vegans and vegan athletes, recipes, animal rights FAQ, documentaries, debates, speeches and more. Apart from that, I use my notebook, which I carry with me everywhere I go. I find that it is such a great tool to write directly to someone else. It takes out all the passionate and sometimes angry/defensive body language and vocal tone, and all that is left is the words. Also, when you write to someone, they have to stop and read it. When you are in a verbal debate, they aren’t always listening. Your journey will take you completely around Australia. Have you encountered any animals you made a special connection with? Absolutely. I’ve had some great encounters with kangaroos, dogs, cows, birds, fish and echidnas. My favorite connection so far has been with a Koala bear who was sitting in the middle of a busy, main road. I stopped to direct traffic around him and ushered him back to the bushes. He looked at me for a long time and actually, he didn’t look so friendly, but that may have been because I had to brake suddenly and missed hitting him by only a few meters. Still, it was my favorite experience with an animal on the journey so far because I’ve never seen a Koala bear in the wild and I might have saved this one’s life. What’s the hardest thing about not talking? The hardest thing is continuously reminding myself to remain silent. It is such a deeply engrained habit to speak when spoken to and acknowledge people when they say “hello” or “excuse me,” and I find that the urge to reply or to speak and say something still comes up regularly, though I am getting more skillful at observing them and letting them pass instead of reacting to them. Though, sometimes the words escape my mouth before I’ve even realized they were coming, so I have slipped up a handful of times. Are there any benefits of not talking? Yes, so many! I am learning to listen. I am more aware of what is going on inside of my mind and my body. I am paying more attention to my surroundings and environment. It gives other people a chance to do more talking than they usually would, and without interruption. It is teaching me about discipline and self control. Most importantly though, it has given me an avenue to raise money for Animals Australia and spread a message of compassion to a number of people who may have never been otherwise interested. Also I’ve received messages from quite a few people who are inspired by what I’m doing and he sacrifice I’ve made. You are a recent vegan convert. Congratulations! What inspired you to go from vegetarian to vegan? Thank you! I have never been happier! I was having a conversation with my cousin, Laura, who was asking questions about Voiceless365, which at the time was only an idea that had been in my head for less than a month. I was telling her about the unnecessary cruelty and suffering humans inflict on animals and how wrong it is. I was explaining all this to her while I was eating cheese! I looked at the cheese I was eating and realized what a hypocrite I was being. After that I never bought dairy products again, though I would still sometimes have them if they were going to waste. After a while I decided I didn’t want to support it in any way and I didn’t want it in my body, no matter what. And that was that. Any idea what you’ll say on January 1, 2015? Absolutely no idea. I’d like to think it will be something totally profound and amazing but I’ll probably just wing it and see what comes out. If you think of anything good, I’m open to suggestions!